I've been following this rumor for several months on dakka's forums. The rumor is supposed to be strongly confirmed with some retailers listing the game in their upcoming product sections. Apparently GW have another board game in the 40k universe set for release this year. Here's hoping it uses the BaC rules engine. Sounds awesome! I hope it's true! Could you provide a link to what you think are the best rumors? Seconded! Where did you hear about that? The Dakka thread goes on for 7 pages about Deathwatch and Genestealer Cult rumors. I'll believe ANY rumor that involves GW selling ever more Space Marines. Genestealer Cult rumors? Yeah, right. Fool me five times, shame on you. Fool me again, "OMG! Do you think they'll make a come back this time? With a limo!" Darn! I think I soiled myself just a little. Genestealers in limos. Wow, that takes me back. What a magical time that was! Game is supposed to be available for pre-order next weekend. Rumors suggest that proper pictures of the components will be released early next week. Still hoping this uses the BaC engine. Powered only by Internet rumors, I offer the following speculation. Rumor has it a second Betrayal at Calth game comes out later in the year. With more, unique HH era models. Deathwatch Overkill contains 10 DW marines who are each characters in RPG supplements (I think they are from the RPG). That would not point to BaC's unit scale game play. That sounds more like individuals than squads/units. But, who knows? Some think a Space Hulk expansion, but I also have problems with the details of that. Expansion of an out of production game doesn't sound like a crowdpleaser for everyone, and SH is not optimized for power armor, shooting bad guys, and unique individuals. My uneducated guess is an Assassinorum type game. Even if this is more individualized, BaC already allows for one model units so I'm still holding out hope that they'll re-use the mechanics. But, like you, I'm just kind of stoked that they seem to be putting out pretty decent board game type releases. Prices are all guess work at the moment, £100/$165 U.S/€135 are what are been put out but no idea. Haven't seen any other content shown yet, Genestealers look great, marines look fine. So no idea if the cardboard will be usable with any of the other games released. No idea on rules yet either. I just received my Calth tile set and cards game bits today so going to have a look through at the rules. I gave u on GW a while back but if the ruleset shines I'll pick up the deathwatch/stealer game, shame the board game will lack reviews for a while due to GW secrecy. Well that looks splendid, tiles set looks square but I'm sure that'll be easily worked around. 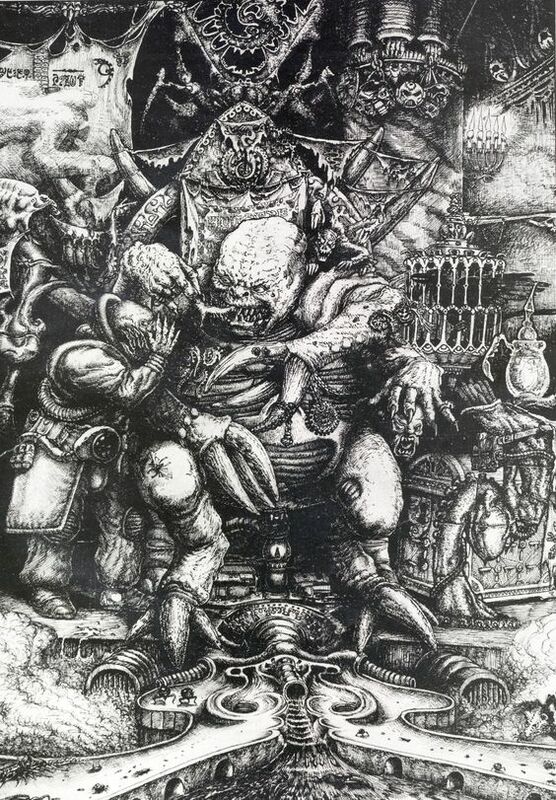 I still hope they'll be a patriarch in the old art sense from what I remember, chap sitting on a throne. I don't remember the old lore but hoping the Primus is the chap in the throne if the Patriarch is the large stealer hybrid. Does anyone know if this is a limited run like Space Hulk 3rd/4th was? Between this, the previous board games, and Battle for Vedros providing a new "in" to 40K for younger players, I think Games Workshop are really starting to do some good things to revive and refresh their hobby. It's all very exciting, really. 1) Every GW boardgame has a limited run. 2) I own or will own every damn GW 40K boardgame (and am always ready to play them, if you can find time to drop by and play). I also think the pictures and descriptions point more to this having more in common with Assassinorum: Execution Force than BaC or Space Hulk. The Genestealer Cult models and descriptions are amazing and inspiring! It looks like they intelligently refined the entire concept of the GSC. Now, as someone who has a 25 year-old Genestealer Cult army in a dusty box in the back of a closet, this will cause much financial soul-searching. Buy the box, or just the cardboard bits on ebay? Dammit GW, get away from my wallet! The units and that magazine photo at the bottom sure make it look like a reskin of Space Hulk. Well it is expensive and breaking it down it still is expensive, I missed the early Rogue Trader days but the Stealer Cult was always some of my favorite art work, the range ruler reminds me a little of the blood bowl range ruler. Hoping the ruleset is good, maybe even some basic campaign stuff would be interesting. I was hoping for this but everything else is spot on the stealers look great, good idea by GW, see if the trend continues with the new 30K game coming later this year. That photo is a late addition. That looks nothing like Space Hulk, and a lot like Execution Force Gone Wild! If there was one thing severely wrong with the original late 1980's RT GSC, it was the portrayal of pure Galactic Evil as a corpulent, blinged-out, fatcat robber-baron Patriarch, surrounded by yes-men sycophants (with a limousine, no less!). It was a joke like the biker gang Squats and the 'Nuns with Guns' Sisters of Battle. And, like the latter two, set the concept back by decades. Be careful what you wish for! Oh, and All Hail eindatadog! What do you mean late addition? That picture is from page 42 of the Space Hulk Campaigns book. Insta-buy-buy for me. The new models are beautiful. I'm hoping this will be an adaptation of the Deathwatch: Tyranid Invasion game developed by Rodeo Games for iOS/PC. Crossing my fingers for a campaign system with leveling-up (but doubting it). The extra cards could either be more model profile/stat cards (likely), or MAYBE an event deck (a la Doom or Warhammer Quest) with events, new enemy spawn/placement. I think he was referring to the final image of the two-page spread in the original post. Well, the magazine article says there is a deck of 30 brood mind cards (and 14 character cards). "Brood Mind Cards" is nice and ambiguous. Sounds like an event deck to me! It's OK, I got this. I know him, he's a Physics Major. I'm imagining it will be more dirty tricks and tactics for the bad guys to play - something like the command cards in Calth, maybe.